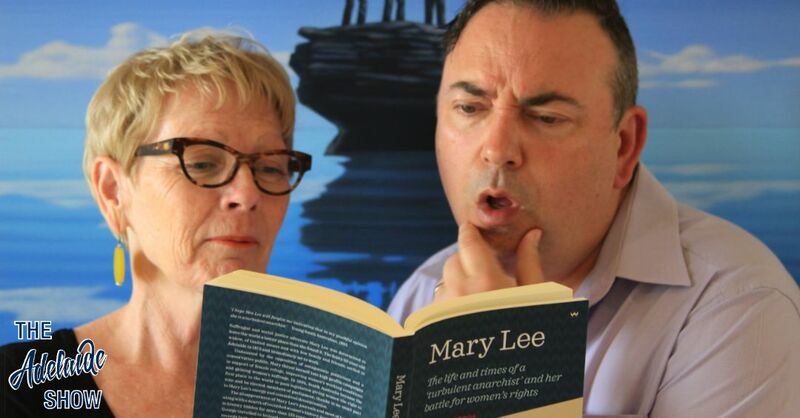 In this week’s episode of The Adelaide Show, we meet Adelaide anarchist Mary Lee, who is the subject of a new biography by local author, Denise George. This book has just been launched on the eve of next year’s 125th anniversary of women’s suffrage in South Australia. Also this week, the SA Drink Of The Week is from Georges Wines. Our new sponsor, Adelaide Night And Day Family Therapy, starts tonight, with principal, Brett Williams, sharing three phrases you can use to build stronger bonds with your loved ones. And in the Musical Pilgrimage, we have music from Thom Lion (or is it). 2015 Georges Wines Exile Shiraz Clare Valley. Tasting notes. In this week’s Mindful Moment, principal of Adelaide Night and Day Family Therapy, Brett Williams, shares three phrases that, when said every day, can create enduring bonds between you and your children and/or partner. They are simple, and powerful. Next year, 2019, marks the 125th anniversary of South Australia leading the world and granting women the right to vote. But as you look beyond the glittering headlines and backslapping, the real story is much more fragmented and disappointing. That story is captured in a new book, Mary Lee, The Life and times of a ‘turbulent anarchist’ and her battle for women’s rights, published by Wakefield Press. osAnd we’re about to take a tour through those dark and patchy streets of Adelaide in the 1800s with the author, Denise George. I am going to start with a confession. I haven’t finished you book because I didn’t want to rush it and I didn’t want to know how it ended before my summer reading began. However, can we start by outlining what it is that Mary Lee’s name should be remembered for? What made you devote years of your life to researching Mary Lee? How do you research someone’s life, when they weren’t “famous” until in their 60s, meaning their early life took place without media attention and fanfare? As I was reading passages in your book that take us down to the minute detail of Mary’s daily life, I marvelled over being able to read from letters and notices from her life. Will the prolific amount of tweeting and facebooking and mobile phone photos taken by everybody today (famous or not) make things easier or harder for future historians to sift through? If Mary Lee had been more like Donald Trump, would life had been easier for you? Denise, growing up, my chest would always swell with pride when I’d hear how South Australia led the way with votes and parliamentary participation for women. But your book shows a more nuanced view of the story with all its vitriol and missteps. When did you first become aware of the dark shadows and brokenness of our history behind the glittery paragraphs in history books? Adelaide, shortly after European settlement was a bleak place for some. The divide between rich and poor grew quickly and destitution for many was commonplace. Can you tease out some of the stories for us of life in Adelaide in the mid 1800s? On a cold July afternoon in 1885, Edward Charles Stirling slipped his fingers down the front of his starched collar to ease the tightness, straightened the daisy in his lapel, tweaked his handlebar moustache and rose to his feet in the green-walled chamber of the House of Assembly adjacent to the Railway Station on North Terrace. Stirling looked toward the Speaker at the end of the chamber as reporters from the Observer and South Australian Register scribbled in their notebooks in the gallery above the Speaker’s Chair. He was a Renaissance man among his peers and every bit the gentleman. Before we dive into the content, that detail about slipping his fingers down his starched collar, puzzled me. I paused and thought, was this drawn from reports by one of those journalists in the gallery, or is this like those movies that say this story is based on real events? Edward Charles Stirling seemed to get the ball moving in parliament on the issue of women’s suffrage, even though his timidity cost the movement some time. Where did he go wrong? The story at this point becomes littered with names that we see on street signs and building frontages, and not always in glowing terms. One of the villains seems to be Ebenezer Ward. Talking of perceptions, I’ve always rolled my eyes when hearing about the Christian Womens’ Temperance Union, and dismissed them as being goody two shoes in overdrive, BUT your book has cast them in a new light for me. For the first time I have seen them not as brainwashed fundamentalists but as women reacting against poverty and domestic violence fuelled by alcohol. Is there anything we could learn from them today, as we continue to hear of women being killed by their partners or ex-partners weekly in Australia? I would respectfully warn the honourable gentleman that it is unwise to enter the lists in such a cause with untried armour and borrowed weapons. This is not an age when specious puerilities may pass for argument, or wordy froth be allowed to obscure the truth. You mention the letters to the editor became the most crucial weapon in Mary Lee’s armoury. Is there any equivalent today? How would someone start agitating for change like Mary Lee did, when grand thinking is drowned out by the noise of the banal? In our Parliament the Dog License Bill, the Sparrows Destruction Bill, a road or a railway, a bridge or a well, anything and everything is allowed precedence of the Women’s Suffrage Bill, and the women’s petition for suffrage. Is this a reflection of the percentage of parliamentarians with penises? Or is there something else at work? Can you put the last pieces into place for us, Denise? How does this story end and how does Mary Lee react after legislation is passed? In the musical pilgrimage, we have a new song from Oh Lion (formerly Thom Lion) called Valium. Thom Lion launched a new song at the Wheatsheaf Hotel last week. It’s called ‘Valium’ and it sounds very different to Thom’s previous work. This time, he’s upped the dance ante and coloured in the moods with more tones. It is a really interesting listen and has an anthem-like “bigness” (yep, words failed me a little). Now, because this has a new feel, they decided to release ‘Valium’ under a new name: ‘Oh Lion’. So, keep your ears peeled for Oh Lion because I hear they have more projects rustling in the bushes and ready to pounce when you least expect it. This interview was so enlightening and interesting. I loved hearing about Mary Lee and her amazing contribution to South Australian history. The writer made Mary’s challenges feel like we had gone back in time to those difficult days. I especially enjoyed learning about what Adelaide was like as a place to live during Mary’s era. The interviewer was excellent too. Asked thought provoking questions.